We’ve been on a bit of a suncatcher kick lately. I love to see them hanging in the window. Even on the cloudiest days, they can bring in a bit of cheery sunlight. We’ve made them for Halloween, Easter, and any day in between. Now we just need some for Thanksgiving. 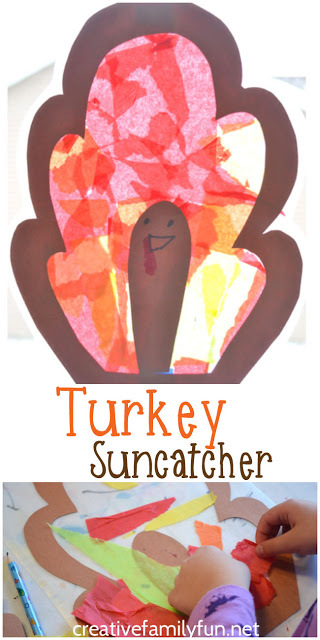 Our turkey suncatcher was such an easy Thanksgiving craft to make and so much fun. It brightens up the window and make me smile every day. 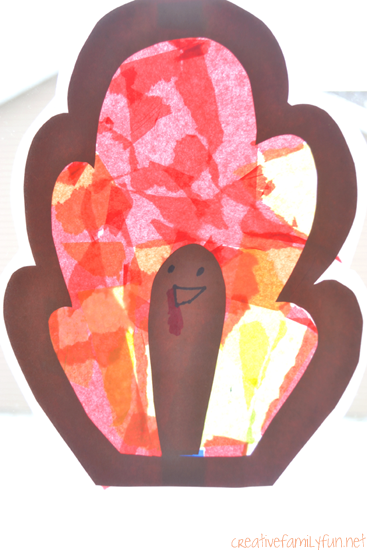 And, once you’ve made your suncatcher, check out all of our Thanksgiving crafts for kids to find more fun activities. Disclaimer: This post contains Amazon Affiliate and other affiliate links. Please see my Disclosure Page for more details. You want to begin by making the frame for your turkey tail. I drew a loopy pattern for my tail; it looked a bit like a bush. Make it the size of a whole sheet of construction paper. 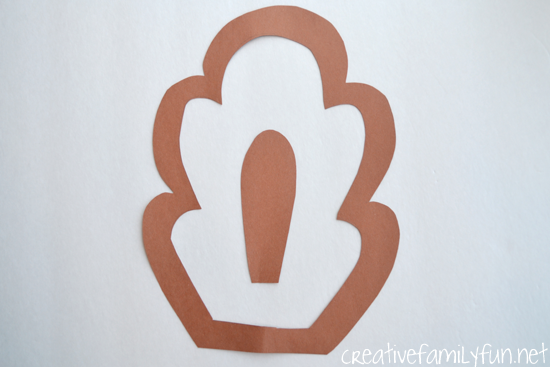 Use your leftover paper to make a simple neck and head piece. Use the markers to draw your turkey face. Measure your turkey tail and cut 2 pieces of clear contact paper for each suncatcher. You want to make sure you have extra contact paper around all the edges. Peel the backing off of one piece of contact paper and place it sticky side up on the table. I usually tape down the edges a bit to keep the contact paper from sliding around. Place your tail outline and your turkey head face-down on your contact paper. Next, and this is the best part, start tearing pieces from your colored tissue paper. 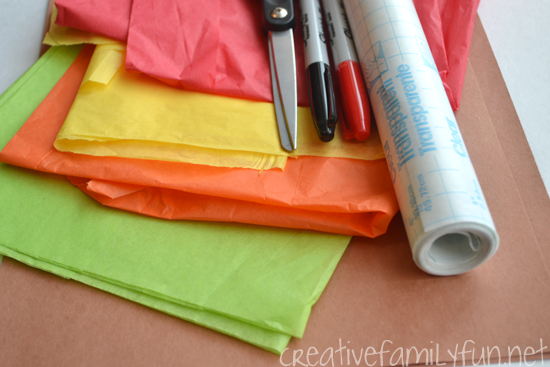 We used red, orange, green, and yellow tissue paper. 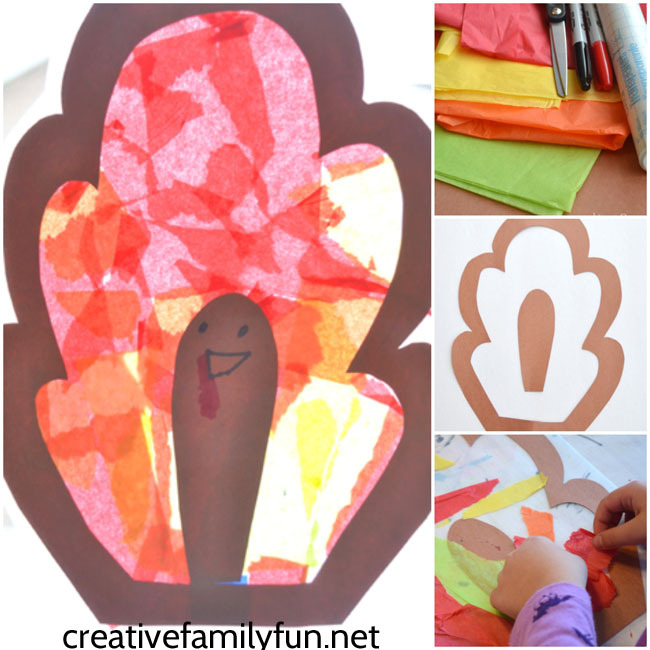 Fill in the open part of your turkey tail with your tissue paper bits. 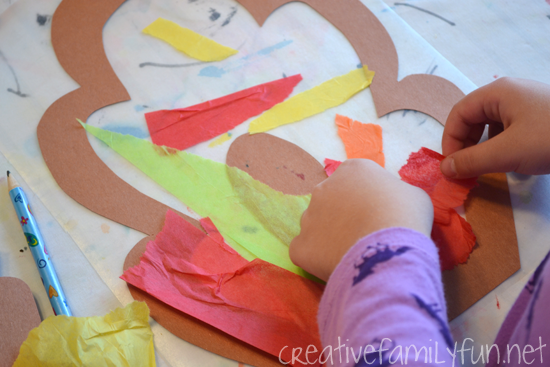 If you’re doing this project with a toddler, go ahead and tear the tissue pieces for them. 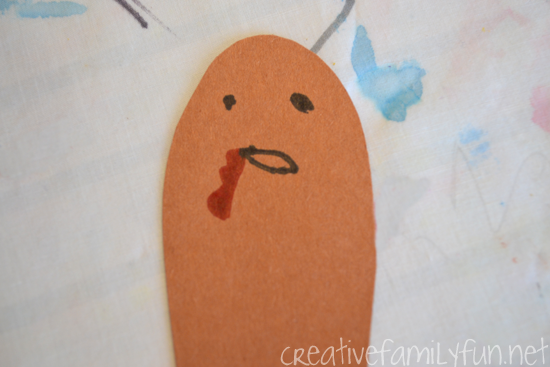 And if you’ve got a toddler, this really is a perfect Thanksgiving craft to do with them. My girls always loved sticking things on contact paper at that age and we made many suncatchers when they were little. After you’ve filled in your tail, carefully attach your second piece of contact paper over top. You’ll want your turkey to be in between both sheets of contact paper. I still do this step for the girls since it is a bit difficult to line everything up. It’s not a necessary step, but by doing this you’ll be able to pack your turkeys away and hang up your Thanksgiving suncatcher year after year. We’ve got our turkey suncatcher hanging up on our patio door and it’s so bright and cheery. We may have to make a few more to brighten our windows!